Immediately relieve head pressure and clear your sinuses. Works quickly and effectively. Sinuses are deep recesses that are not easily reached. 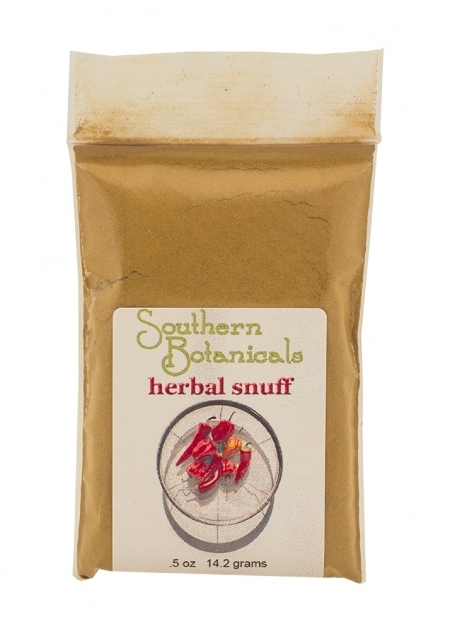 If you need a fast-acting, deep-cleansing simple solution, herbal snuff will give you results! Unblock this area naturally without any chemicals that might dry the delicate membranes which need to breathe or that prompt the body to protect itself by making more mucus. Ingredients (*Organic, +Wildcrafted): Goldenseal Root+, Bayberry Bark+, Garlic* and Cayenne Pepper*. Directions: Snuff up a small amount, like the head of a q-tip, into one nostril at a time. The sinuses will discharge and clear. For long-term blocked sinuses, repeat this a few times. The snuff can also be made into a tea to drink ot to irrigate the sinuses with using a syringe or netti pot.